PET (Polyethylene Terephthalate) has outstanding clarity, good impact resistance, and good barrier properties to resist grease, oil, cold and sunlight. PET has very good alcohol and essential oil barrier properties. Labels adhere better to PET than LDPE. PET also has better barrier properties than LDPE and provides a longer shelf life for the contents. Have you ever noticed the taste of water in a LDPE bottle versus a clear PET water bottle? The Child Resistant caps are also Tamper Evident. This eliminates the need for a shrink band or foil seal. 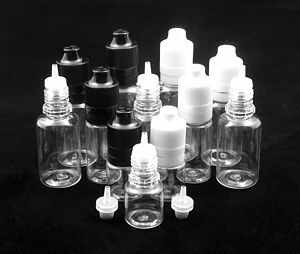 We carry 5ml, 10ml, 15ml and 30ml bottles that include an uncontrolled long tip dispenser, and cap of your color preference. We sell our 1/2oz and 1oz glass Boston Rounds with a child resistant glass pipette. CRC protocol testing document available by request. Dropper Bottles available in Clear, Amber and Cobalt Blue. 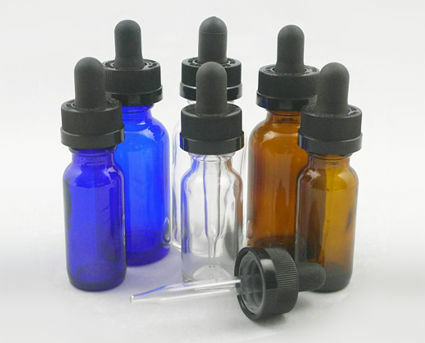 We sell our 15ml and 30ml glass Dropper Bottles with a Child Resistant/Tamper Evident glass pipette. 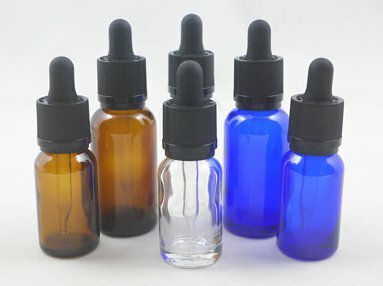 Amber, Cobalt Blue, and Clear bottles are available. Screw the cap all the way down to seat the tamper evident ring on the Dropper Bottle cutting ring. The tamper evident band will break when the closure is unscrewed.